Facebook is using their audience of over 185 million users in the United States for some good. An article by Huffington Post reports that Facebook will begin to show Amber Alerts in the news feeds of users who live in areas where a possible abduction may have occurred. The National Center for Missing and Exploited Children and Facebook launched the initiative after seeing user’s post their own alerts and photos — and help find missing children faster. 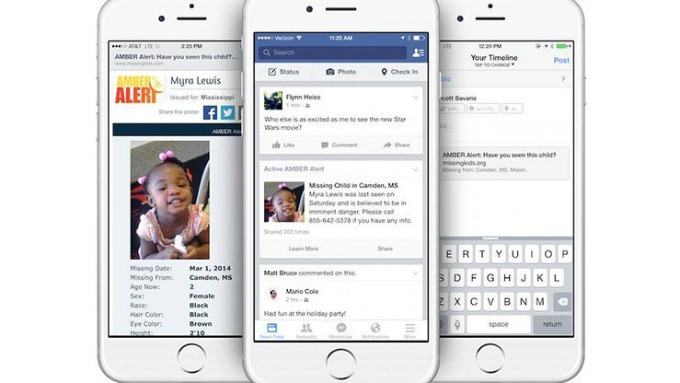 While Amber Alerts (America’s Missing: Broadcast Emergency Response) are already broadcast through radio, television, and highway billboards, Facebook is the first social media site to share alerts with their audience. In a situation where time is of the essence, Facebook hopes that notifications targeted to areas near the incident will spread more quickly, reach more peoples, and bring children home faster.